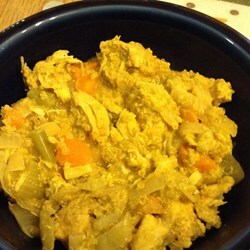 Chicken, quinoa, and apples, combine in this tasty, easy curry! Place the chicken, onion, celery, apple, chicken broth, milk, curry powder, and paprika into a slow cooker; stir until mixed. Cover, and cook on Low for 4 to 5 hours. Stir in the quinoa during the final 35 minutes of cooking. Serve when quinoa is tender.